Habitec Security designs, installs, and services both residential and commercial security systems throughout Ohio and Michigan. Below are just a few of the local areas we service. If you are unsure if we service your area, please call us at 888-422-4832. 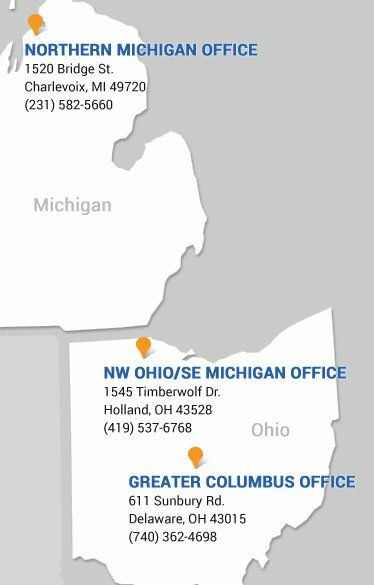 Our Toledo, Ohio, office covers west to Defiance, east to Sandusky/Port Clinton, south to Findlay/Lima and north to Dundee, Monroe, Down River Detroit, and Ann Arbor, Michigan. Our Columbus, Ohio office covers west to Springfield, east to Zanesville, south to Circleville and north to Marion. Our northern Michigan office in Charlevoix covers east to Boyne City, south to Traverse City and north to Petoskey and Harbor Springs.